Within days of the 28th anniversary of the chemical weapons attack on the residents of Halabja in Iraq’s Kurdistan Region – which a 1991 Human Rights Watch investigation called “the single largest chemical weapons attack against a civilian population in the world” – we are monitoring reports of chemical weapons once again being used against a civilian population in Iraq. The Islamic State or Iraq and al-Sham (ISIS) – against the predominantly Iraqi Shia Turkmen residents of Taza Khurmato (also known as Taza), a farming village just south of the city of Kirkuk. This week, I talked with Mustafa al-Obeidi, head of an Iraqi humanitarian organization who visited the village of Taza just a week after the March 8, 2016 chemical weapons attack by ISIS. He claims that as many as 6,000 inhabitants have been made violently ill by the mustard gas and chlorine-containing rockets used in the attack. This far outstrips media reports, which estimate 500 to 800 casualties. Al-Obeidi claims that the public health center in Taza could confirm the high number of those affected, however Iraq’s Ministry of Health has asked the center’s medical staff to stay quiet. He believes that the Iraqi government might be downplaying the severity of the attack in order to avoid panic. Taza is located near Kirkuk in Northern Iraq and its estimated population of 35,000 are mostly Iraqi Shia Turkmen – one of the many groups targeted by ISIS militants. It is close to the village of al-Bashir, which has been held by ISIS since June 2014, and Taza has been subjected to repeated attacks ever since (read more about these attacks on our Iraq Security and Humanitarian Monitor timeline). Most of Taza’s residents lack the resources necessary to seek treatment anywhere other than the village’s small health center, which is poorly equipped to respond to the crisis. Al-Obeidi emphasized his belief that the Iraqi government’s response has been inadequate and called for a militarized decontamination plan to evacuate the areas affected, allow experts to conduct necessary tests, and provide immediate treatment to those suffering. Al-Obeidi told me that over 40 Katyusha rockets landed on Taza when the attack happened, striking 12 homes. He added that the neighbors of these damaged houses were the most affected by these chemical attacks because the gas turned into dust and continues to contaminate surrounding areas. On March 12, Popular Mobilization (PMU) General Abu Radha al-Najar said that an Iranian medical team specialized in chemical gases arrived in Taza to provide treatment for those injured. On March 13, Taza’s District Director Hussein Adil announced the arrival of American and German medical experts to run tests on areas affected by the mustard gas. 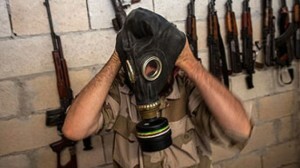 The Organization for the Prohibition of Chemical Weapons (OPCW) has confirmed through laboratory testing that ISIS has indeed used chemical weapons containing mustard gas in Iraq. Mustard gas is a chemical agent absorbed through inhalation, consumption, or direct contact. Symptoms include severe itching and burning of the skin, eyes, and respiratory tract, skin discoloration, painful blisters, shortness of breath and, in many cases, death. Unlike other chemical agents, symptoms of mustard gas exposure do not appear for 12 to 24 hours, making it more difficult to detect and treat. At least one woman and three children, Fatima (3 years old), Masuma (10 years old) and Ali Mousa (6 months old) have died from mustard gas exposure in Taza. For more on ISIS’s use of chemical weapons in Taza and elsewhere in Iraq, visit our blog post. Subscribe to ISHM for ongoing monitoring of this and other crises in Iraq.